OurEnergyPolicy.org | How Do Americans View Environmental Issues? How Do Americans View Environmental Issues? A recently released report by VeraQuest Inc. titled “VeraGreen: A Look at American Attitudes and Behaviors on Environmental Issues,” examines how Americans view environmental issues such as global warming and the involvement of government in the private sector. The report surveyed a stratified random sample of 3,506 online respondents to be nationally representative and has an error range of 1.66% at a 95% confidence level. The study was fielded between October 3 and October 11, 2012. 36% of respondents believe society does not put enough emphasis on environmental issues, compared to 21% that believe it’s too much emphasis. 51% of respondents don’t believe that global warming is an issue today. 36% of respondents said they will consider alternative fueled cars when they’re in the market next. Almost two-thirds of respondents said the government should be responsible for setting fuel efficiency standards, compared to 37% that believe it should be left to the marketplace. Nearly two-thirds of respondents said the government should be involved in subsidizing private companies that produce renewable forms of energy. What, if anything, is surprising about these results? What policy directions do the numbers point towards? 6 Responses to How Do Americans View Environmental Issues? The first two points seem to contradict each other. It seems that most Americans are quite supportive of protecting the environment but either don’t believe in global warming or think that it’s too long-term of an issue to address today. This points to the possibility of pushing for an overall environmental tax rather than a carbon tax or GGE tax. However, it also points to the need for educating Americans about just how strong the scientific consensus is that global warming is happening. Identifying the problem correctly is necessary to get the best solutions. The key datum, not represented in the key findings, presumably because the question was not asked, is how much are Americans willing to pay to remediate these environmental issues? It would seem to be a pertinent inquiry, as the central issues regarding environmental impact involve hidden costs. Sadly, we appear to be a public that desires many governmental actions, but is willing to pay for only military ones. Unless and until We the People get our minds around the fact that dealing with those costs will be neither free nor easy, no significant progress will be made. The best case in point is Congress’s continued failure to even consider, much less enact a carbon tax. Your fundamental point about the survey is spot on, Joel. 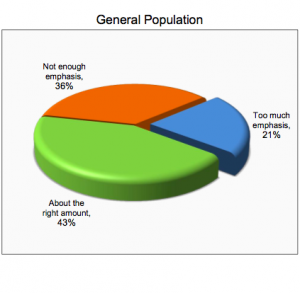 More balanced surveys indicate that the willingness to pay is minimal, and concentrated among a rather limited minority of the population. I would take some exception to your more generalized argument. The two wars undertaken after 2001 were glaringly not paid for, for the first time in US history. And the more importunate case of the public’s unwillingness to balance its demand for government benefits with its willingness to pay for them is the looming unsustainability of the major entitlement programs: Social Security, Medicare, Medicaid. Joel – excellent point about willingness to pay. Those types of surveys are wrought with problems though. The EPA has tried to use WTP (stated preference survey) in certain of their rulemakings (cooling water intake structures under Section 316(b) of the Clean Water Act being a recent example) but it has been challenged by industry. 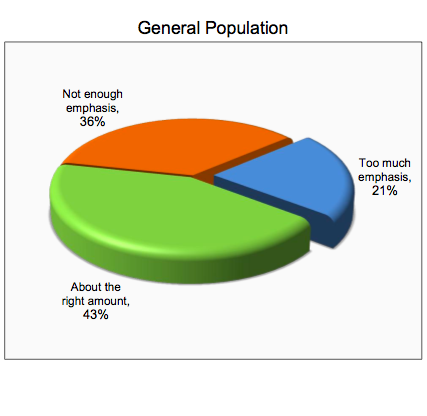 WTP surveys are extremely difficult to design properly without unduly influencing respondents. In addition, the distributive effects of who bears the cost and who benefits present economic justice headaches. For instance, for any policy (tax) aimed at energy, economically disadvantaged households will bear a greater brunt of the cost. I agree with your tenet that until we as a society are willing to pay in the here and now for benefits that are deferred into the future, it will be difficult to have policy-driven action. Dawn, that’s true. But then it is very hard to design any survey that does not bias responses one way or another. My sense is that results of WTP surveys probably overstate the real willingness to pay, based on the hoary principle that ‘talk is cheap,’ and it is easier for you to say you are willing to pay for something than it is to actually fork over the dough. My caveat about “we as a society” is that there is no singular “we” nor a solitary society. The world as a whole and even most nation-states are highly plural, comprised of diverse social groups and interests. If willingness to pay is limited and there is little sense of urgency from climate change arguments (especially in light of current economic troubles that motivate us to postpone investments in alternatives), might there be other arguments that might be more urgent and compelling that are being avoided?